Want To Know What Death Looks Like? 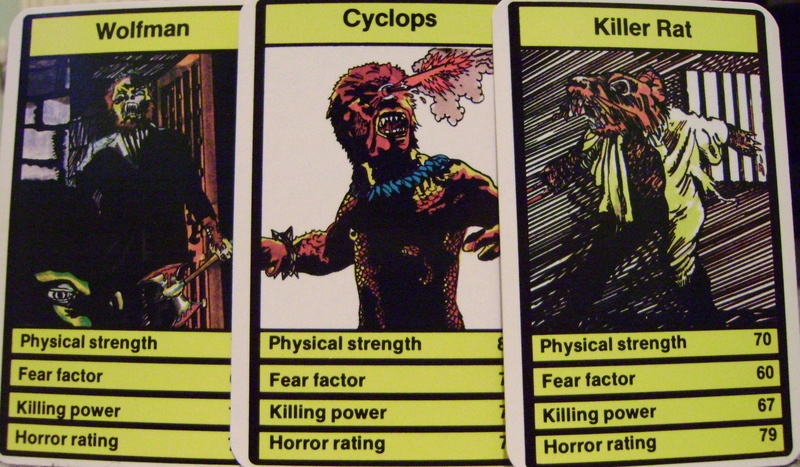 These Vintage Horror Top Trumps Will Show You! 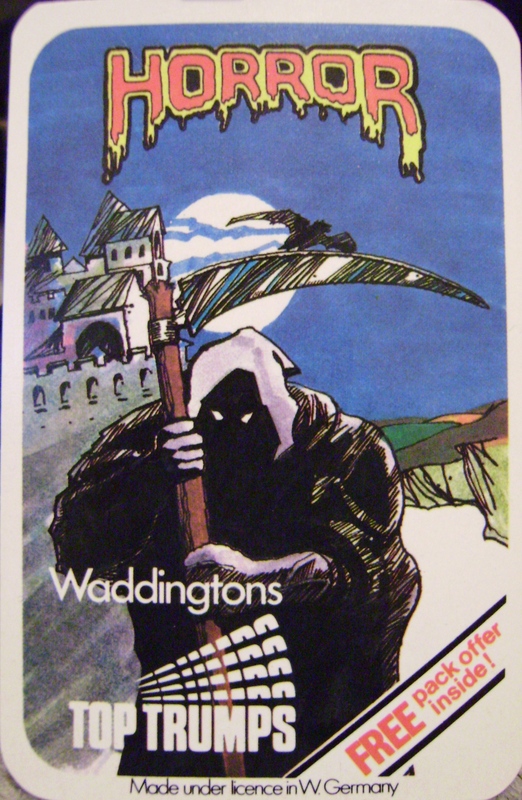 If you were a kid in the UK during the late 70s / early 80s then you would have owned some Top Trumps cards … It was inevitable. Your parents would buy a pack for a long car journey. Your Grandparents would come down to visit and thrust a pack in your hands as soon as they got through the door. A pack would be sitting at the bottom of the stocking on Christmas Day morning. These days they are bigger and more popular than ever, they never seem to fade away or die. It’s been said that after a Nuclear Holocaust the only survivors will be cockroaches and they will inherit the Earth, I disagree … It will be cockroaches AND Top Trumps cards. They are eternal! Each pack of Top Trumps is based on a theme, such as cars, aircraft, dinosaurs or characters from a popular film or television series. Each card in the pack shows a list of numerical data about the item. For example, in a pack based on cars, each card shows a different model of car, and the stats and data may include its engine size, its weight, its length, and its top speed. If the theme is about a TV series or film, the cards include characters and the data varying from things like strength and bravery to fashion and looks, depending on the criteria. All the cards are dealt among the players. There must be at least two players, and at least one card for each player. The starting player (normally the player sitting on the dealer’s left) selects a category from his or her topmost card and reads out its value. Each other player then reads out the value of the same category from their cards. The best (usually the largest; in the case of a sports car’s weight or a sprinter’s 100m time, for instance, lower is considered better) value wins the “trick”, and the winner takes all the cards of the trick and places them at the bottom of his or her pile. That player then looks at their new topmost card, and chooses the category for the next round. My favourites as a child were the two HORROR sets they released, my Brother and I must have burned away hours in heated contests trying to get the better of each other. These times had almost totally faded away in my memory until a week ago when I was browsing through some boxes in a charity shop and I came across an original, vintage pack. 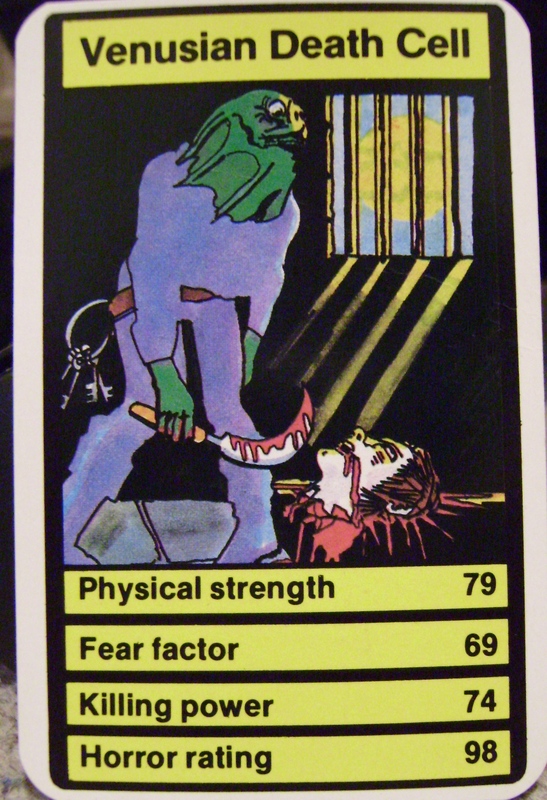 It was the second Horror set with no missing cards in fantastic condition … I had to have it! Looking at them now the first thing you notice is how truly appalling the artwork was but in terms of nostalgia these are solid gold! First up, the winner of the ‘Coolest Card’ award goes to the DEVIL PRIEST … The art here is actually fairly good and as such was used as the cover image for the whole pack at the front of the box. His stats are VERY solid across the board and it was always a character you hoped to get when the cards were dealt. 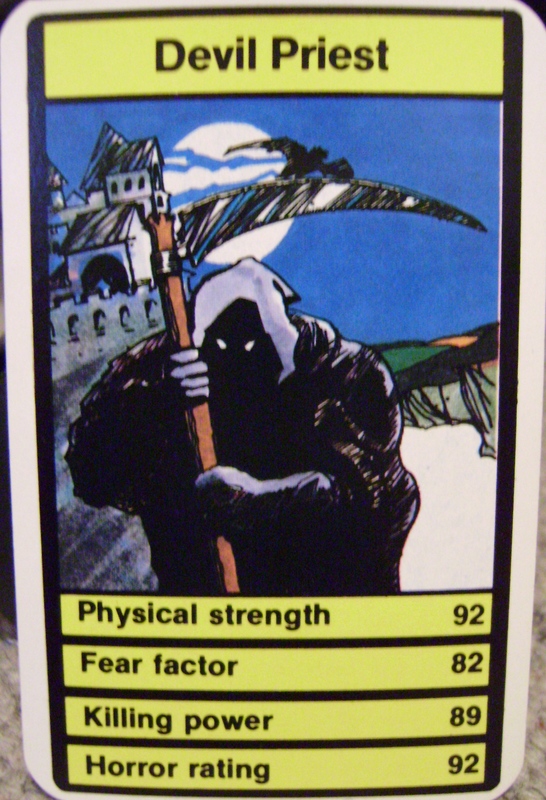 Next is the winner of the ‘Weakest Card’ award which goes to The LIVING SKULL … Yeah he’s rubbish. 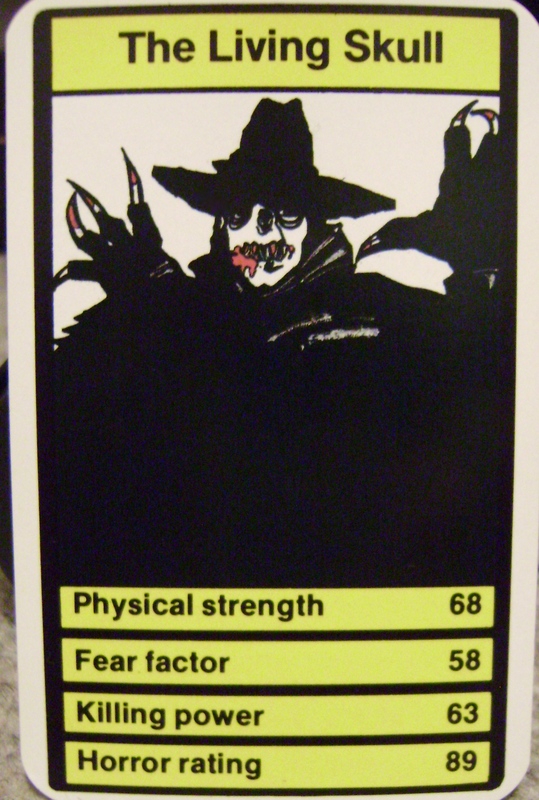 His ‘Horror Rating’ is good but the rest isn’t going to get you anywhere and his ‘Fear Factor’ of 58 is the joint lowest score on any card in the pack. I feel bad for the guy though, that 58 is very harsh, if I saw him standing at the end of my bed my personal Fear Factor would be off the scale!! We move on to the winner of the ‘He Shouldn’t Be In This’ award which goes to THOR?? … Don’t ask me?, Natalie Portman would have zero interest in this fella’ but his strength rating is the highest in the set. 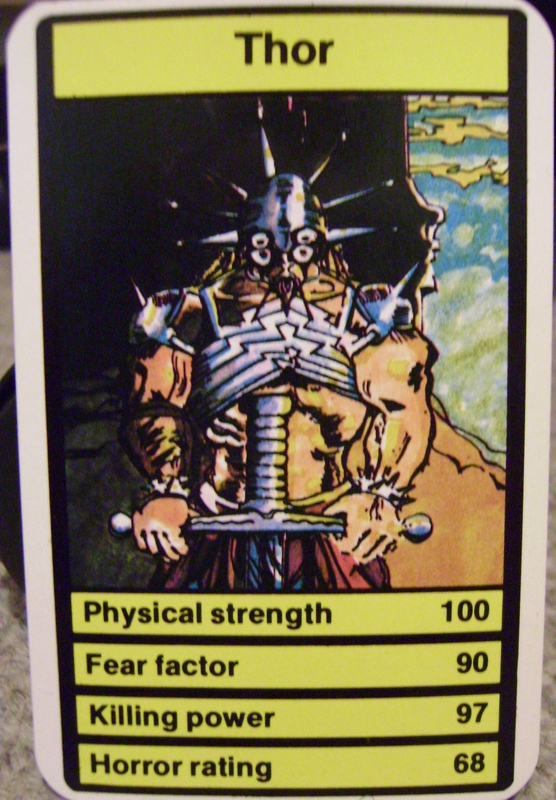 We now come to the ‘Worst Card Art’ award which is easily won by The SLIME CREATURE … No slime, a trunk like an Elephant and wearing what looks like some kind of metal chastity belt? He is stabbing a small boy with a spear but barely holding it with the very tips of his metal claws, its all quite bad. 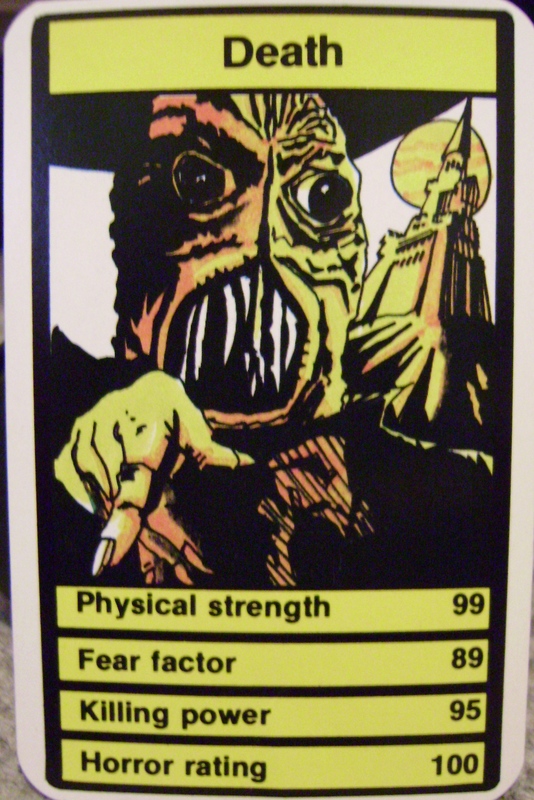 The ‘WTF?’ award can only go to the VENUSIAN DEATH CELL card … SO, it’s a prison cell on Venus? … Inside, what looks like a Sea Devil from Doctor Who is chopping Human heads off and wearing blue overalls? I don’t understand!!!? Finally the award for ‘Most Powerful Card’ goes to DEATH … Yup, thats Death. In your last moments, at the end of all things … a creature with a head like a badly carved potato will stand over you and pass judgment. 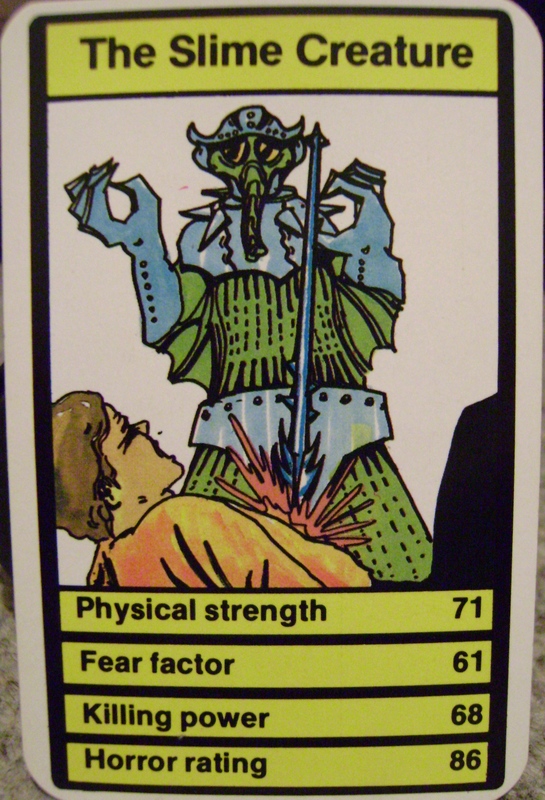 As a card it’s the one you wanted, the stats are high in every department and the Horror Rating of 100 would almost guarantee a winning hand. WOLFMAN, who will sneak up and kill you with an Axe?? So … Who wants to play?? ← NECA Wins Toy Fair With Awesome New Aliens, Predator and Friday the 13th Toys!